For Sale -- 1700 E Warm Springs Ave - the "Boise Castle"
Think I've posted this before but want to save this. Still pulls the tears. Layer 2 Fabric and Background fabric 10" squares right sides together. Draw lines diagonally from corners and sew 1/4" either of these 2 lines. Cut from middle of sewn block sides (in half and half again) into quarters and then cut along drawn lines from corner to corner. = 8 half square triangle squares. Sew the half square triangles into geese. = 4 geese units. Sew 2 geese together to make a geese unit. Arrange all 4 units so the colors are in the same color order for the block and make a pinwheel. Cut 2 1/2" sashing to the length of the sides of the block. Sew to one block side and then sew to the next block and so on into a row (4 blocks wide). Sew sashing strips to cornerstones in a row and then sew to 4 block unit row. Quilt Size: 76" x 81"
Layer a 5" square and a 5" background fabric square right sides together and sew around all the outside edges. Cut diagonally from the corners. = 4 half square triangle squares. 'Square up' these to 3". Sew these together to make the geese. = 2 geese. Sew 4 geese in a row. You need 3 geese assemblies per row. Cut Background fabric same width as the geese blocks (5 1/2"). and 12 1/2" long. You need 3 background fabric lengths per row. Sew alternately; geese unit and background fabric unit. Then sew the 2 ends together into a loop. Fold lengthwise randomly and cut on fold in one of the background units. Do this for all the rows at various places. Leave 4 of the rows as originally done without sewing into a loop. Sew 3 of the rows with the background fabric unit to the other end of the row. Arrange so the geese strips all point the same direction and sew rows together. Celia Sheen plays the theme tune from ITV's drama series "Midsomer Murders" on the Theremin. She has done so, along with incidental music, on the soundtrack of every episode for fourteen years. This fascinating instrument was the world's very first electronic instrument, invented in 1920 by Russian scientist Lev Theremin. Of course, nobody ever sees Celia's performances on the recordings, but what makes it interesting is that the Theremin is played without being touched! Notice that the border is made up of snowballed squares. With black centers in the stars. With a 6 pointed star y seam. Supplies: Quilt Size: 70" x 90"
All done with half-square triangles, arranged in various ways; into pinwheels, chevrons, stars, and flying geese. Quilt Size: 87" x 87"
Use Easy-8 method to make the half-square triangles. 10" squares of background color (probably white) and pattern colors or other colors. Draw lines diagonally from corner to corner = cutting lines in shape of X.
Sew on either side of these lines. Result 8 half-square triangles (4 1/2"). Check size and square up if need be. 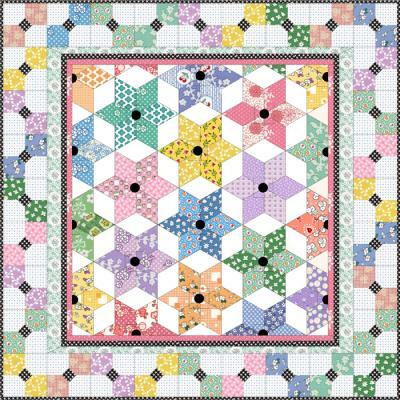 ------8 - half-square triangles in pairs, to make 4 background fabric flying geese. Mix together to form a paste and put in sealable container. To use, take a small amount and massage it into the clean skin of your armpits. It will feel granular at first. Video says it is clear and will not leave a white transfer onto your clothes.